LAS VEGAS, April 7, 2019: Aerosmith launched their Las Vegas residency, AEROSMITH: DEUCES ARE WILD, at Park Theater at the new Park MGM resort last night combining visceral rock with high technology to bring to life their incredible story of a struggling group from Boston who became America's all-time top-selling rock 'n' roll band. 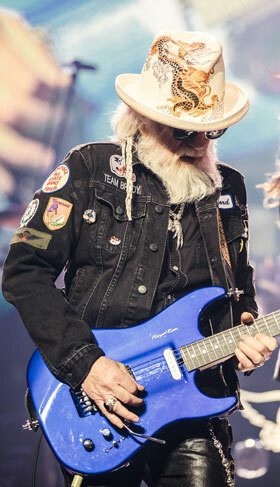 The sold-out audience, including celebrities Miranda Lambert and Diane Warren, were the first to see the epic production, sure to be known as the band's greatest spectacle in their stunning 50-year history. The centerpiece of the show was the 90-minute live performance from the original Aerosmith band members: Steven Tyler, Joe Perry, Tom Hamilton, Brad Whitford and Joey Kramer - who continue to deliver one of the most cohesive and electrifying performances in music. The band goes beyond the average concert by taking fans on a deep dive of their groundbreaking career with exclusive, unreleased audio and never-before-seen visuals from Aerosmith's archives featured through a twelve screen media presentation (including a 140 ft x 40 ft high def screen) produced by Oscar and Emmy-winning global visual effects studio Pixomondo. Using cutting- edge technology, Pixomondo also brings to life Aerosmith's infamous logo - the wings - which magically unfold to herald the band's arrival on stage. Every vantage point in the intimate Park Theater, the first THX Certified live performance venue featuring L-Acoustics L-ISA Immersive Hyperreal Sound, will bring fans face-to-face with the band, including the world's first THX On-Stage VIP experience and walkway that stretches from the stage to the balcony seats. With over 230 high-performance L-Acoustics loudspeakers and nearly 300,000 Watts of power, L-ISA surrounds the audience in a sphere of sound to convey the band's stellar setlist in vibrant, hyperreal detail, wrapping fans in the ultimate 360 degree rock 'n' roll experience. Laurent Vaissie, L-Acoustics CEO - USA & Canada adds, "Beyond achieving unparalleled precision, power, and ultra-high spatial resolution, L-ISA is a revolutionary creative tool that allows artists to craft sound as an intimate experience true to their art, with complete freedom to paint a multidimensional soundscape in hyperreal strokes. Sound can now stretch and morph. It can dynamically travel in real time and surround fans from every direction, taking the spectator on an incomparable emotional journey. Aerosmith has defined American Rock for five decades and we're thrilled to hear L-ISA unleash its full potential for them and their devoted fans in tandem with the inspired creative vision of Amy Tinkham and Giles Martin." 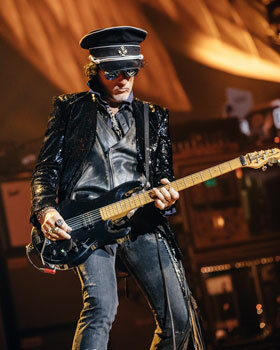 In the THX On-Stage VIP section, fans will have privileged access to studio-quality audio direct from the Aerosmith mixing board via MIXhalo's audio technology through their own pair of THX Certified 1MORE Triple Driver in-ear headphones. Expertly tuned by GRAMMY Award-winning Sound Engineer Luca Bignardi, these are the world's first headphones to be THX Certified. To become THX Certified, 1MORE's Triple Driver headphones passed hundreds of tests. The rigorous certification program ensures the headphones provide a well-balanced frequency response with minimal channel imbalance, premium level audio output and minimal distortion at the required sound pressure level, and a high degree of isolation to effectively attenuate external noise. "THX Certification assures an exceptional audio experience for headphone users," said THX Home GM and SVP Peter Vasay. "We couldn't be more excited that Aerosmith fans get to enjoy the show through the world's first THX Certified headphones. Together, 1MORE and THX continue to raise the bar for audio quality in the headphone market." Steven Tyler (vocals), Joe Perry (lead guitar), Brad Whitford (guitar), Tom Hamilton (bass) and Joey Kramer (drums) are a living piece of American music history, having sold over 150 million albums worldwide and been inducted into the Rock and Roll Hall of Fame. They are the recipients of countless awards including four GRAMMYs, eight American Music Awards, six Billboard Awards and 12 MTV Video Music Awards among many other honors. Proving that they can cross genre-boundaries with ease, these rock legends have even taken home a Soul Train Award for Best Rap Single for their remix of Run DMC's "Walk This Way." 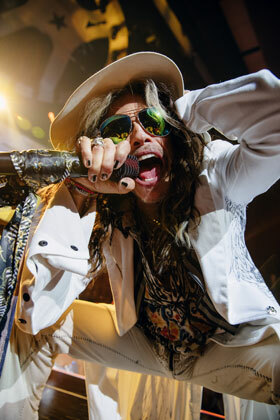 On April 6th, the band kicked off their 35-date MGM Las Vegas residency, AEROSMITH: DEUCES ARE WILD. 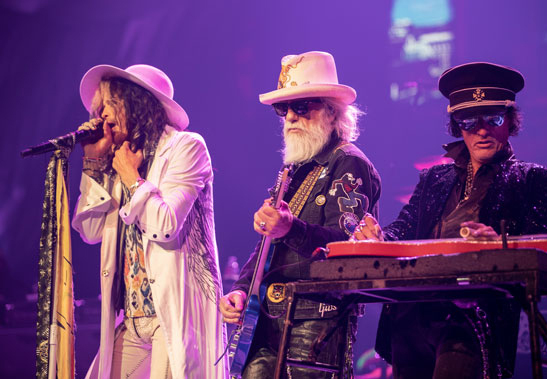 The show will then travel to the east coast in August for a special edition AEROSMITH: DEUCES ARE WILD–EAST COAST RUN at three MGM Resorts' properties - MGM National Harbor (National Harbor, Md. ), Borgata Hotel Casino & Spa (Atlantic City, NJ) and MGM Springfield (Springfield, Mass.). With scores of multi-platinum albums, AEROSMITH continues to inspire generations to get their wings, get a grip and just push play. It is no wonder why they are one of the most beloved bands of all time. Tickets starting at $75, as well as VIP packages including meet & greets, can be purchased at all Ticketmaster outlets or online at ticketmaster.com/aerosmith. All shows are scheduled to begin at 8 p.m.